Fans of A Song Of Ice And Fire—the books on which the popular HBO drama Game of Thrones are based—have a lot of theories. Some are about Jon Snow’s true parentage; some are about whether Brandon Stark ate his friend Jojen Reed; some are about whether Tyrion Lannister is the product of Daenerys Targaryen and Khal Drogo having conceived a time-traveling fetus; some of the craziest ones involve author George R.R. Martin publishing The Winds of Winter, the highly-anticipated next book in the acclaimed fantasy series. Here’s a theory: he never will! If you want to go down the rabbithole on this, you’ll find lots of opinions, with some people even offering statistical analysis projecting when he’ll turn pages in to his editors. A credible alternate analysis? This dude has no pages to turn in. Since the 2000 publication of A Storm of Swords, the well-received third book in his series, he’s published one (great) sort-of book, split into two volumes, that wasn’t even close to being finished, and spent a lot of time being a famous person enjoying life. In the four years from 1996 to 2000 he published three books; in the 15 years since he’s published part of one. People have been waiting to read his new pages since the last ones came out almost four years ago, this theory argues, because there are no new pages. Doesn’t look a day under 35. Photo via HBO. 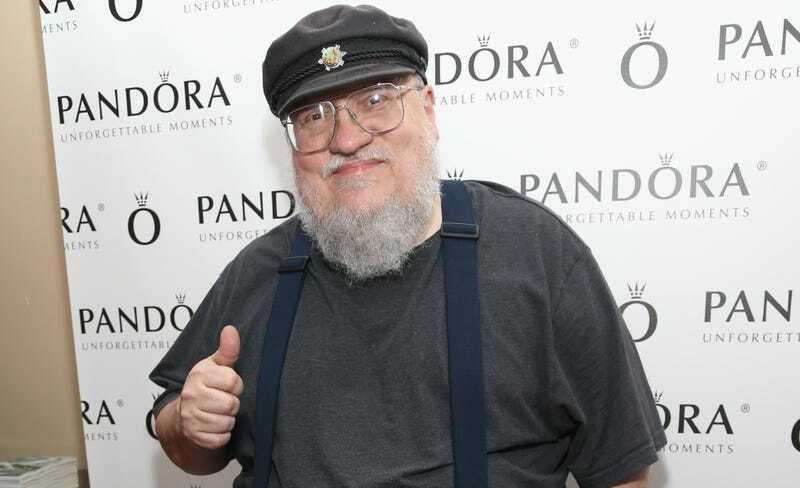 What all people with theories can agree on is that this dude is old and rich, appears to really like traveling and writing takes about the New York Giants and science fiction awards and doing other things that aren’t writing new books in his famous ASOIAF series, and hasn’t published a finished book in that series this millennium. None of this suggests more books are coming our way. It would be great if this dude gave us some pages that explained whether or not Jon Snow and Stannis Baratheon are dead, whether Aegon Targaryen is or isn’t a fake, etc. etc., but he can only do so if he has those pages, which he probably doesn’t. Pages will turn up eventually, at which point people will have theories about whether he actually wrote them—one credible theory will be no, because he never had any pages—but either way the question of whether Bran traveled through time to bone his own aunt will have been (sort of) resolved, and what more do you want than that?